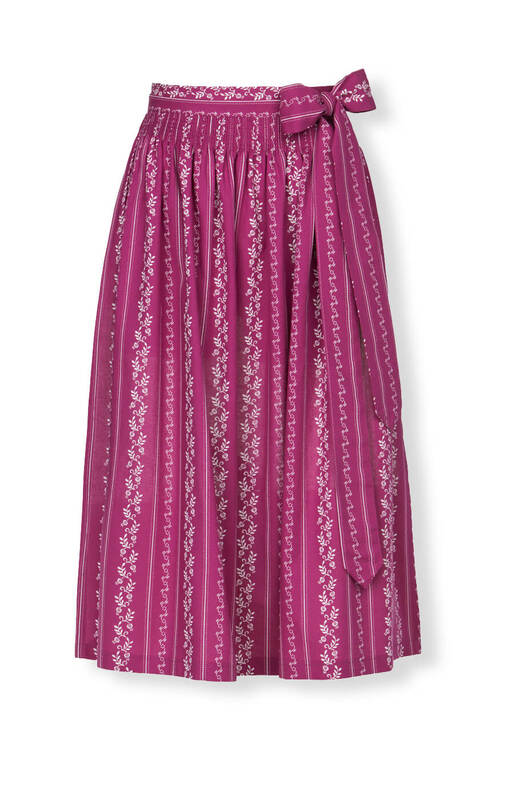 Dirndl skirt with a delicate apron pattern. This apron cleverly combines simplicity with a bold colour. The intense berry colour blends with white to create simple tones and offers a beautiful eye-catching accessory. The delicate vertical pattern with pretty floral tendrils and fine lines is a subtle ornament. The visual effect conveyed by the long lines and fine-spun pattern is the impression of extra height, which is very flattering for the feminine figure. The top hem is pleated so that the apron cascades gracefully. The broad ribbons that tie into a matching bow at the side are another delightful embellishment. Super Qualität. Trägt sich super.